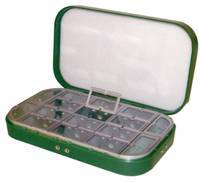 Clip fly box range: Aluminium fly boxes with small, medium and large clips for wet and dry trout flies and salmon flies in sizes 5, 7 and 10 clips per row. Also Compartment boxes with clips in the lid. Produced with quality ABS plastic shells, making them tough, light and great value for money. Our most popular interiors are included in this range. A choice of flat foam and compartment boxes. Available in either green or black finish. We are proud to introduce this value brand for the Richard Wheatley customer. The combs in our clip boxes are made of nickel silver and therefore will not rust. Size in inches: 3 1/2 " x 3 2/8 " x 1"
Size in inches: 6 " x 3 1/2 " x 1 1/2"
Traditional aluminium fly boxes with different internal configurations. 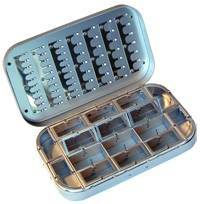 Each compartment has a spring loaded lid ideal for dry flies. 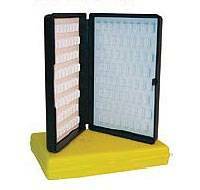 The other side having individual fly clips(12 comp box) or flat foam (16 comp box). All sizes 6" x 3 1/2" x 1 1/8"